FortuneJack is relatively new to the online casino market and is looking to make its mark through extensive player support. FortuneJack offers provably fair games and accepts a variety of cryptocurrencies. FortuneJack provides the standard games that are available at other reputable bitcoin gaming sites. However, FortuneJack developed proprietary technology to offer a one-of-a-kind experience. The comprehensive playing options include standard slot games and unique betting options developed by FortuneJack. Additionally, FortuneJack welcomes all players across the globe, including the United States, to take part in their new online gaming site. FortuneJack offers new and existing gamers with an array of promotional offers. To start, FortuneJack provides new players with the standard 100% deposit bonus (up to 3 bitcoins!). However, FortuneJack does restrict the matching deposit based on gameplay. For specific details, then FortuneJack does provide the finer points on the Promotions page. Generally, players must place 40 wagers to receive the full bonus. FortuneJack does stipulate that certain games have varying contribution percentages, so check your favourite games. Most casinos, virtual and traditional, typically have a loyalty program. FortuneJack is no different but does provide the rules and formula to move up the ladder to the Platinum member. As your membership level rises, then players receive higher deposit match rates and exclusive offers! For loyal FortuneJack players, then the casino provides even more rewards. 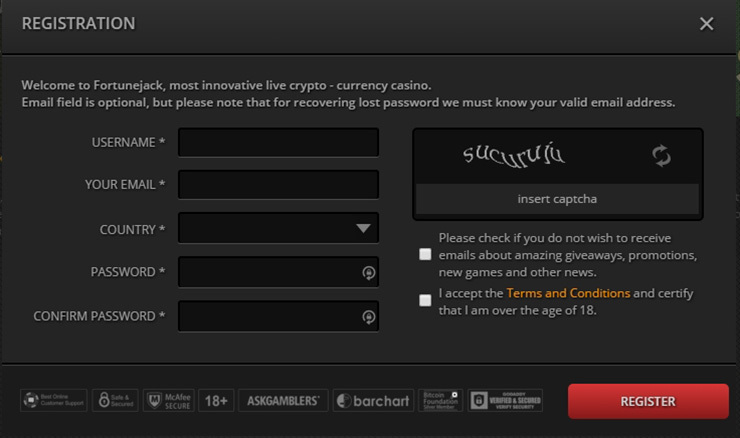 FortuneJack offers regular players with weekly giveaways totalling 10 bitcoins. FortuneJack awards the top players in the 10 most popular games with prizes that are awarded every Friday. In addition to loyalty based promotions, FortuneJack offers special weekly promotions as well. These promotions vary every week and range from the Unlucky Jack (where FortuneJack rewards up to 20% of a player’s net loss back to their account) to Most Active Chat User (which rewards active participation in the FortuneJack chat room for sharing constructive and helpful advice). FortuneJack is licensed and regulated in Saint Kitts and Nevis. The regulatory environment in Saint Kitts and Nevis does not restrict individuals, however, FortuneJack recommends players check their local regulations. For new and experienced bitcoin casino players, FortuneJack notes that their games are probably fair and provides the documentation on the site. Provably fair documentation allows players to know that every game is truly random and fair. FortuneJack uses the standard provably fair technology within the online casino market. In addition, FortuneJack created unique betting games called Binary Trader and Any Bet that are exclusive to FortuneJack players. The FortuneJack registration process is pretty standard. New players must locate the Join Now button and submit the following form, which includes an optional email address. Players have the flexibility to deposit and withdraw funds in any of these accepted currencies. The minimum deposit and withdrawal amount is 0.0001 bitcoin (or equivalent), which is pretty standard. To fund accounts, then players simply need to send the deposit amount to the FortuneJack players account address provided at the cashier page. To withdraw winnings, players simply send funds in their player account to their individual cryptocurrency address. FortuneJack truly offers players with the easiest options in cryptocurrency gaming. FortuneJack continues the commitment to player fairness by sharing the casino’s provably fair documentation. Increasingly, players are looking for casinos to publish the technology that shows how the online casino games are fair and outcomes are established. “It is now possible to verify the fairness of each game played by yourself. Thanks to Provably Fair system, no one can possibly know the outcome of a specific deck until the results are generated. FortuneJack allows players to see how outcomes are based on the gambler’s input and a secret number that is disclosed and changed for every round in every game. This allows players to verify that the game was played fair. The willingness to publish the Provably Fair Documentation and provide players with a code to confirm outcomes is a clear point of differentiation between FortuneJack and its competitor bitcoin casinos. FortuneJack games are designed to allow players to “change the seed” whenever they want before the start of the gaming session. This would affect the outcome of the game, so this ability ensures that neither the player nor the casino has the ability to predict the results. FortuneJack provides responsive customer service and live chat. The professional customer service team typically responds best via email, but the casino operator offers 24/7 support. In fact, a great sign of their professionalism is the response to comments in bitcoin casino review forums. For some players, the lack of telephone support may be limiting, but the FortuneJack customer service team makes great strides to provide sufficient information not only on the casino website but wherever bitcoin gamblers are looking for information. FortuneJack is a new online casino that is developing a reputation as a player-friendly casino. There are some pros and cons with this approach because the FortuneJack is still new to the scene.